They say that I was carved to wait forever. pink. But you winked at me. I knew you knew. wrinkled, slow, and weathered--a perfect mate. and fly. I'll wait forever. I'm good at waiting. Joshua Gage likes to get drunk, cuss a lot, and peek up women’s skirts. You can trust him about as far as you can throw a wet mattress up an elevator shaft, and even then it’s best to shoot him in the knee, just so you know he won’t run away on you. Read To Watch You Drown - a poem. 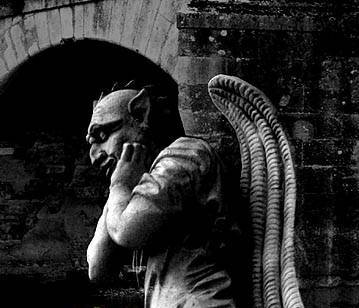 "Gargoyle Love Song" Copyright © 2002 Joshua Gage. All rights reserved. This page last updated 10-24-02.